In the current divisive and challenging climate in the United States, many lesbian, gay, bisexual, and transgender (LGBTQ) people struggle to find their safe spaces, especially in schools. Historically and presently, LGBTQ educators specifically have faced challenges being their authentic selves. My colleagues and I have been studying the experiences of LGBTQ educators for over a decade. Our findings from the first two national surveys (conducted in 2007 and 2011, reported in A Safer Place? LGBTQ Educators, School Climate and Implications for Administrators ) have shown that too many LGBTQ teachers feel unsafe in their workplace climates. In fact, one third of these educators felt that their jobs were at risk if they were out to administrators and over half felt their jobs were at risk if they were out to students. Approximately one quarter also reported being harassed at the schools where they work. Slowly, the support for LGBTQ educators has been increasing since our first two surveys were conducted; however, even today, there are still times when LGBTQ educators do not feel very safe. A colleague of mine and I are currently examining responses from the third and most recent installment of our LGBTQ educators’ survey, conducted in 2017. As we found in our past surveys, we see that LGBTQ educators’ experiences differ depending on where, what, and who they teach. For example, elementary teachers are more worried about being “out” to their students than high school teachers. Elementary teachers also report less LGBTQ inclusion in their schools’ curriculum and fewer LGBTQ-related resources in their schools’ libraries than their high school counterparts. Similar to findings from the general population of teachers reported by GLSEN , we found regional differences in LGBTQ educators’ reports of their school’s policies. LGBTQ educators in the Northwest were more likely than those in the Midwest to have school policies addressing the use of homophobic and transphobic language. Regional differences extended to LGBTQ teachers’ experiences of harassment – with those in the Midwest reporting more harassment than those in the Northeast. And it’s not only LGBTQ educators who suffer when their school is not LGBTQ-inclusive. We know that inclusive schools are critical for LGBTQ youths’ educational success and personal well-being. Yet, despite the fact that LGBTQ students who are exposed to positive representations of LGBTQ people and history report more positive school experiences and better educational outcomes, GLSEN’s most recent National School Climate Survey  found that less than one-fifth of LGBTQ students attend schools with an LGBTQ-inclusive curriculum. In order to provide the best education and support to students, including teaching an LGBTQ-inclusive curriculum, teachers need to be the best teachers they can be, and they can only do that when they feel safe to be exactly who they are. Clearly, our findings indicate that this is not always the case. So, what can be done? One avenue for change is within the school leadership. School administrators can have a major impact on the overall school climate and workplace climate. In a 2015 Ed Week interview ,  Kevin Jennings, GLSEN founder and former U.S. Assistant Deputy Secretary of Education, stated the following about educational leaders, “I think if there was one thing that I would like to see happen is it's greater leadership on the part of superintendents and principals.” With greater leadership will come more consistent support and guidance for LGBTQ educators, which will translate to better outcomes of all measures for LGBTQ students. By taking steps to ensure the right policies, resources, and practices are in place, school administrators promote a more positive and inclusive environment for LGBTQ educators and LGBTQ students alike. At the GLSEN Respect Awards , we recognize exemplary role models—students, educators, individuals and corporations—that have made a significant impact on the lives of LGBTQ youth. At the event in New York later this month, one of the role models we're recognizing is Stephanie Byers, an Instrumental Music Educator from Wichita High School North as Educator of the Year! Our school is covered in GLSEN safe and inclusive stickers . Teachers and other staff choose to put them up and it’s amazing at how frequently you see one in a classroom window. Being in a large, urban, district, people often come to me to tell me about something happening in another building. I will then call our GLSEN chair person and ask her if she knows about it and who she can talk with to help? I also take GLSEN surveys and share them with our faculty during staff inservices. I would like to find ways to get our GSA more involved with the Greater Wichita GLSEN . PRISM was started when a trans student came out to our principal Mrs. Haines and asked why we didn’t have a GSA at our school. She and the student worked together using GLSEN resources online and formed our GSA a month later. A small group of LGBTQ+ students worked hard that year to support each other and teach others in our community about who we are. This year our club grew to 30-40 students, from our original 12-13 members. We have continued to normalize queer people in our school, community and society through our activities and participation. Many of our events came from the GLSEN website . The information on forming the club was our starting point. The GLSEN Jump Start Guide  was important in forming our GSA and knowing our rights . 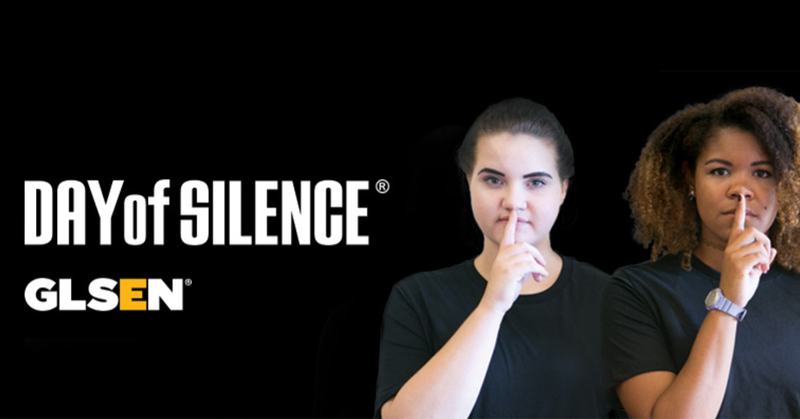 We have taken ideas for events, and printed out signs and stickers from the GLSEN site for all our events, such as the Day of Silence , which is a personal favorite. The Day of Silence significant because of the opportunity to teach people that not everyone has a voice and how hard it is to remain quiet, the patience one must have to not make a sound, and how all this is representative of those who cannot speak out of fear they will be harmed. We had a successful No Name-Calling Week  as well. It is easy to do with the resources GLSEN provides. The resources give us great information and topics to discuss and act on with PRISM. The article on Empowerment and Self-Identification  has helped in the foundation of our GSA’s ideals. The concept of encouraging those around you to love themself is so incredibly important. I’ve personally used the article on Misgendering and Respect for Pronouns  to help students support their transgender peers. It is important to know the proper pronouns for others and yourself. GLSEN’s education resources have been key to our success with all students. GLSEN has been such a major help in setting up PRISM and teaching others the importance of equality. Thank you all so much for the important work you do to support us! Laws like this one are often referred to as “no promo homo” laws because they prohibit the positive portrayal of homosexuality, particularly in health class. And these laws are currently found in 7 states: Alabama, Arizona, Louisiana, Mississippi, Oklahoma, South Carolina, and my state, Texas. In these seven states, nearly 10,000,000 students are affected by this discriminatory legislation. Not surprisingly, according to GLSEN’s latest research , schools in states with “no promo homo” laws were more likely to include negative representations of LGBTQ topics in school curriculum, and were less likely to include LGBTQ topics overall, compared to schools in states without these laws even in health classes. When students see negative representations of themselves in their lessons at school they suffer. In other words, these laws have a real, negative impact on students like me. When your identity is already underrepresented in every outlet (such as media, athletics, and fashion), the last place you want your identity to be covered up is in your education. If you live in one of the seven states with these laws, I urge you to send a letter to your state representatives urging them to repeal the law. If you don’t, check out GLSEN’s guide on LGBTQ-inclusive curriculum  – it shows how and why educators should include positive representations of LGBTQ topics at school. As the Education Manager at GLSEN, I wait all year for Teacher Appreciation Week . My job is centered around finding, supporting, and amplifying the work of rad educators in school across the country who are doing the hard work of creating affirming learning environments for their LGBTQ students. During Teacher Appreciation Week, the rest of the world chimes in too. In a polarizing binary pronoun world, navigating gender-neutral pronouns can be daunting at first. Though most people use they/them/their in everyday conversation without a second thought, it can be a whole different issue when applying it to a single person. Even though the use of singular “they” has been added to the Merriam-Webster Dictionary  and the APA style guide , it has sadly not yet made its way into English classrooms across the country. Today is GLSEN’s Day of Silence , when students and educators take a vow of silence to highlight the silencing and erasure of LGBTQ people at school. I strive to help my students to break this silence, and to find the words that help them express who they are, no matter who that is. For this year’s GLSEN Day of Silence on April 27th, the 2017-2018 National Student Council shared on social media how they are breaking the silence. With this year’s focus on highlighting marginalized voices within the LGBTQ+ community, some council members are either educating others on intersectionality and the importance of allyship, emphasizing the voices of those unable to speak up, or letting their true self shine proudly. We encourage you to use this day to continue engaging in dialogue in your schools and community centered around the bullying of LGBTQ students. Be sure to take a picture of yourself or your GSA breaking the silence with our sign  and share on social media, tagging @GLSENofficial . How are you breaking the silence for LGBTQ youth? Let us know on Twitter  or Instagram  with your own sign  and #DayOfSilence! This Friday, thousands of students across the country will participate in GLSEN's Day of Silence,  a daylong vow of silence symbolizing the to highlight the silencing and erasure of LGBTQ people at school. After taking a vow of silence throughout the day, students often break the silence with an event hosted by a student group, community organization, or local GLSEN Chapter. Check out the list below to see whether a local GLSEN Chapter is hosting an event near you. Prepare by sharing to your teachers, friends, and coworkers over the course of the day why you’re being silent. Share with your teachers and administration the Day of Silence Educator Guide. You can find all of the materials at glsen.org/dayofsilence . Don’t use duct tape to cover your mouth. Use GLSEN stickers, buttons, and shirts. Alternatively, design your own swag that visibly shows your support without hurting yourself! Remember you have a right to free speech. If you feel your rights are being violated, submit a form to request help at the bottom of glsen.org/dayofsilence . Use the momentum from Day of Silence to stay involved in making schools safer and more inclusive for LGBTQ youth. Sign up for advocacy alerts at glsen.org/glsenup . Register your school’s GSA  to get helpful resources all year long!